Make a model of a cube for your math class or create a giant pair of dice with just a sheet of poster board, scissors, a ruler and some tape. 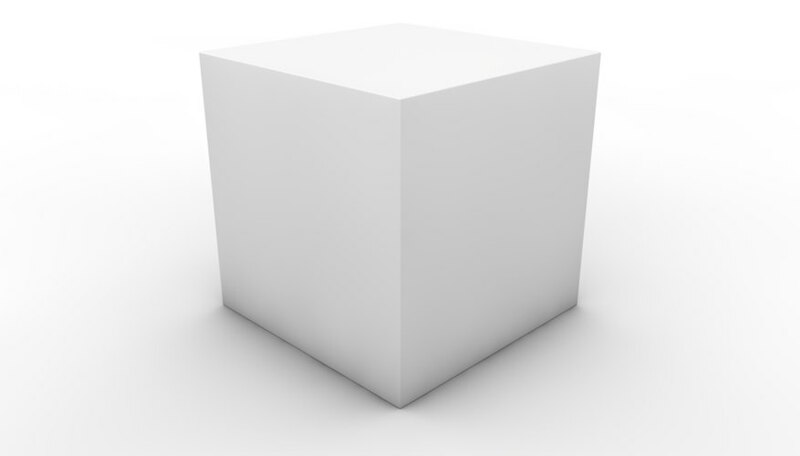 Once you’ve mastered the 6 1/2-inch cube, you can easily make cubes in all sizes. Measure and mark a 6 1/2-by-1-inch rectangle near the top center of the poster board. Mark a 6 1/2-inch square below the rectangle with the shapes sharing a side. Make three more 6 1/2-inch squares below the first, each adjoining the adjacent square. Measure and mark a 6 1/2-inch square to the left of the second square from the top, again adjoining that square. Make a 6 1/2-by-1-inch rectangle on the outside edges of each of the last two squares. Cut out the cross-shaped template. Score the remaining lines lightly with your scissors or with a craft knife. Fold on the scored lines to form the cube. Tuck the 1-inch tabs into the folded cube. Tape the edges together with the clear packing tape. You can also glue the tabs in place. However, the tape will better protect the edges of the heavy paper. Cardstock or construction paper also make quick and colorful cubes. Canton Art: Chapter 4 -- Let's Learn a Little More Geometry!